Cedar of Lebanon cone showing flecks of resin as used in the mummification of Egyptian Pharaohs. In polymer chemistry and materials science, resin is a solid or highly viscous substance of plant or synthetic origin that is typically convertible into polymers. Resins are usually mixtures of organic compounds. This article focuses on naturally-occurring resins. Plants secrete resins for their protective benefits in response to injury. The resin protects the plant from insects and pathogens. Resins confound a wide range of herbivores, insects, and pathogens, while the volatile phenolic compounds may attract benefactors such as parasitoids or predators of the herbivores that attack the plant. Most plant resins are composed of terpenes. Specific components are alpha-pinene, beta-pinene, delta-3 carene, and sabinene, the monocyclic terpenes limonene and terpinolene, and smaller amounts of the tricyclic sesquiterpenes, longifolene, caryophyllene, and delta-cadinene. Some resins also contain a high proportion of resin acids. Rosins on the other hand are less volatile and consist, inter alia, of diterpenes. 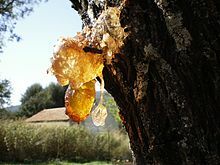 Notable examples of plant resins include amber, Balm of Gilead, balsam, Canada balsam, Boswellia, copal from trees of Protium copal and Hymenaea courbaril, dammar gum from trees of the family Dipterocarpaceae, Dragon's blood from the dragon trees (Dracaena species), elemi, frankincense from Boswellia sacra, galbanum from Ferula gummosa, gum guaiacum from the lignum vitae trees of the genus Guaiacum, kauri gum from trees of Agathis australis, hashish (Cannabis resin) from Cannabis indica, labdanum from mediterranean species of Cistus, mastic (plant resin) from the mastic tree Pistacia lentiscus, myrrh from shrubs of Commiphora, sandarac resin from Tetraclinis articulata, the national tree of Malta, styrax (a Benzoin resin from various Styrax species), spinifex resin from Australian grasses, and turpentine, distilled from pine resin. Amber is fossil resin (also called resinite) from coniferous and other tree species. Copal, kauri gum, dammar and other resins may also be found as subfossil deposits. Subfossil copal can be distinguished from genuine fossil amber because it becomes tacky when a drop of a solvent such as acetone or chloroform is placed on it. African copal and the kauri gum of New Zealand are also procured in a semi-fossil condition. Extremely viscous resin extruding from the trunk of a mature Araucaria columnaris. Solidified resin from which the volatile terpenes have been removed by distillation is known as rosin. Typical rosin is a transparent or translucent mass, with a vitreous fracture and a faintly yellow or brown colour, non-odorous or having only a slight turpentine odor and taste. Rosin is insoluble in water, mostly soluble in alcohol, essential oils, ether, and hot fatty oils. Rosin softens and melts under the influence of heat. Rosin burns with a bright but smoky flame. Rosin consists of a complex mixture of different substances including organic acids named the resin acids. Related to the terpenes, resin acid are oxidized terpenes. Resin acids dissolved in alkalis to form resin soaps, from which the purified resin acids are regenerated upon treatment with acids. Examples of resin acids are abietic acid (sylvic acid), C20H30O2, plicatic acid contained in cedar, and pimaric acid, C20H30O2, a constituent of galipot resin. Abietic acid can also be extracted from rosin by means of hot alcohol. Pimaric acid closely resembles abietic acid into which it passes when distilled in a vacuum; it has been supposed to consist of three isomers. Rosin is obtained from pines and some other plants, mostly conifers. Plant resins are generally produced as stem secretions, but in some Central and South American species such as Euphorbia dalechampia and Clusia species they are produced as pollination rewards, and used by some stingless bee species to construct their nests. Propolis, consisting largely of resins collected from plants such as poplars and conifers, is used by honey bees to seal gaps in their hives. Shellac and lacquer are examples of insect-derived resins. Asphaltite and Utah resin are petroleum bitumens, not a product secreted by plants, although it was ultimately derived from plants. 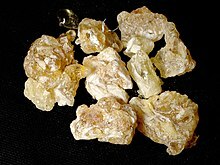 Human use of plant resins has a very long history that was documented in ancient Greece by Theophrastus, in ancient Rome by Pliny the Elder, and especially in the resins known as frankincense and myrrh, prized in ancient Egypt. These were highly prized substances, and required as incense in some religious rites. The word resin comes from French resine, from Latin resina "resin", which either derives from or is a cognate of the Greek ῥητίνη rhētinē "resin of the pine", of unknown earlier origin, though probably non-Indo-European. The word "resin" has been applied in the modern world to nearly any component of a liquid that will set into a hard lacquer or enamel-like finish. An example is nail polish. Certain "casting resins" and synthetic resins (such as epoxy resin) have also been given the name "resin." Some resins when soft are known as 'oleoresins', and when containing benzoic acid or cinnamic acid they are called balsams. Oleoresins are naturally occurring mixtures of an oil and a resin; they can be extracted from various plants. Other resinous products in their natural condition are a mix with gum or mucilaginous substances and known as gum resins. Several natural resins are used as ingredients in perfumes, e.g., balsams of Peru and tolu, elemi, styrax, and certain turpentines. Other liquid compounds found inside plants or exuded by plants, such as sap, latex, or mucilage, are sometimes confused with resin but are not the same. Saps, in particular, serve a nutritive function that resins do not. Plant resins are valued for the production of varnishes, adhesives, and food glazing agents. They are also prized as raw materials for the synthesis of other organic compounds and provide constituents of incense and perfume. The oldest known use of plant resin comes from the late Middle Stone Age in Southern Africa where it was used as an adhesive for hafting stone tools. 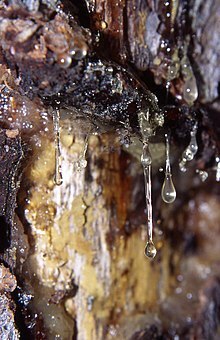 The hard transparent resins, such as the copals, dammars, mastic, and sandarac, are principally used for varnishes and adhesives, while the softer odoriferous oleo-resins (frankincense, elemi, turpentine, copaiba), and gum resins containing essential oils (ammoniacum, asafoetida, gamboge, myrrh, and scammony) are more used for therapeutic purposes, food and incense. 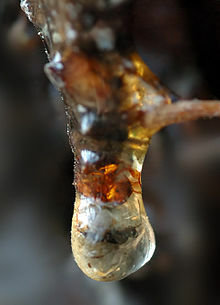 The resin of the Aleppo Pine is used to flavour retsina, a Greek resinated wine. Many materials are produced via the conversion of synthetic resins to solids. Important examples are bisphenol A diglycidyl ether, which is a resin converted to epoxy glue upon the addition of a hardener. Silicones are often prepared from silicone resins via room temperature vulcanization. Balsam of Peru – a balsam used in food and drink for flavoring, in perfumes and toiletries for fragrance, and in medicine and pharmaceutical items. Biodegradable – plant resins are naturally biodegradable in many circumstances. Resin casting – casting with a resin, usually using a synthetic not a natural resin. ^ Chemistry, International Union of Pure and Applied. IUPAC Compendium of Chemical Terminology. iupac.org. IUPAC. doi:10.1351/goldbook.RT07166. ^ a b Fiebach, Klemens; Grimm, Dieter (2000). "Resins, Natural". Ullmann's Encyclopedia of Industrial Chemistry. Weinheim: Wiley-VCH. doi:10.1002/14356007.a23_073. ISBN 978-3-527-30673-2. ^ Bittrich, V.; Amaral, Maria C. E. (1996). "Flower morphology and pollination biology of some Clusia species from the Gran Sabana (Venezuela)". Kew Bulletin. 51 (4): 681–694. doi:10.2307/4119722. ^ Gonçalves-Alvim, Silmary de Jesus (2001). "Resin-collecting bees (Apidae) on Clusia palmicida (Clusiaceae) in a riparian forest in Brazil". Journal of Tropical Ecology. 17 (1): 149–153. doi:10.1017/s0266467401001092. ^ Simone-Finstrom, M.; Spivak, M. (2010). "Propolis and bee health: The natural history and significance of resin use by honey bees". Apidologie. 41 (3): 295–311. doi:10.1051/apido/2010016. ^ "Queen Hatshepsut's expedition to the Land of Punt: The first oceanographic cruise?". Dept. of Oceanography, Texas A&M University. Retrieved 2010-05-08. ^ "resin, n. and adj". OED Online. Oxford University Press. September 2014. Retrieved 2 December 2014. ^ "resin (n.)". Online Etymology Dictionary. Retrieved 2 December 2014. ^ Kozowyk, P. R. B.; Langejans, G. H. J.; Poulis, J. A. (2016-03-16). "Lap Shear and Impact Testing of Ochre and Beeswax in Experimental Middle Stone Age Compound Adhesives". PLOS ONE. 11 (3): e0150436. doi:10.1371/journal.pone.0150436. ISSN 1932-6203. ^ "Non-wood forest products from conifers - CHAPTER 6". www.fao.org. This page was last edited on 22 March 2019, at 15:54 (UTC).